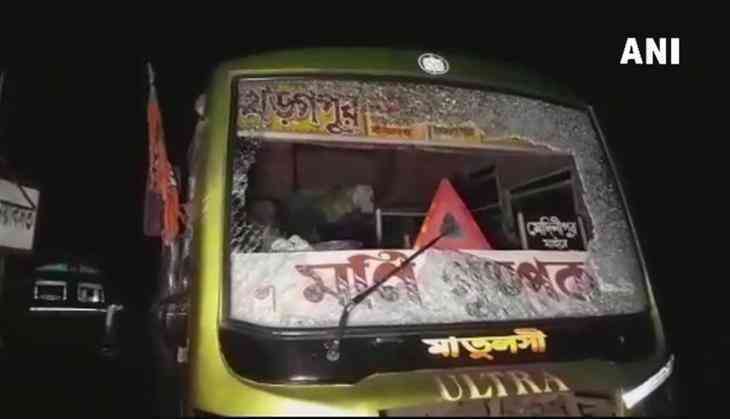 BJP workers bus was attacked by unidentified miscreants in Mamata Banerjee's West Bengal where Bharatiya Janata Party (BJP) President Amit Shah is to address a gathering in Mayo Road. The incident took place on West Bengal's Midnapore where the BJP supporters bus going to the Shah's rally was attacked with stones. According to the news agency ANI, A Bus was attacked by unidentified people filled with supporters who were going to join the Amit Shah's rally. FIR lodged in Chandrakona Town police outpost. The attack damaged the bus and glass were broken, even the bus driver was injured. Apart from this, there is no news of anyone else being injured. On Saturday, ahead of BJP President Amit Shah rally, posters of "Anti-Bengal BJP" has been seen around his rally venue in Mayo Road, in the middle of the city before his Kolkata visit. Trinamool Congress has posted posters in place of Kolkata, which says 'go back Anti-Bengal. As per reports, following Amit Shah's rally the venue has been covered up with banners, posters and flaxes. 500 Kolkata Policemen will be deployed in the security of Mr Shah. Though the security of the police is not keeping the Yuva Morcha, therefore, five hundred and fifty volunteers are being brought to the ground. The BJP youth wing has also deployed about five hundred volunteers at the ground for the security of BJP chief. It is noteworthy that last month, there was a major negligence of the Mamta Banerjee-led TMC Government in Prime Minister Modi's Midnapore rally. Many people were injured when the portion of the tent fell. There was a report that the Blue Book Rules were violated in the security of PM Modi. Before the PM Modi rally, neither police personnel were briefed nor any rehearsals were made. Apart from this, there was no coordination between the organizers and the district administration. This caused a major accident.